What You Need: Paper plate; assorted feathers; scrap of red construction paper; 2 googly eyes; scissors; glue or tape. How You Make It: Cut inward from bottom of plate in two places about 2″ apart angled inward but not connecting (adult job). Fold in half and upward to form turkey head. Glue or staple feathers to top of paper plate. Cut out wattle shape from red construction paper and glue on. Glue on googly eyes. 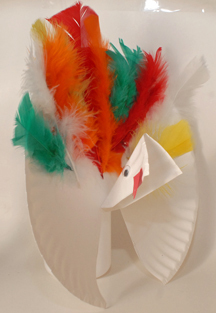 This entry was posted on Monday, October 29th, 2007 at 4:00 am	and is filed under Thanksgiving crafts. You can follow any responses to this entry through the RSS 2.0 feed. Responses are currently closed, but you can trackback from your own site.